Breakfast easily gets dull for me. When I get up in the morning it's always a mad dash to pick something to wear (if I haven't already) and figure out what to cook for breakfast and lunch. I had gotten to the point where I simply rotated between girts, cream of wheat and a microwaved omelette on a slice of toast. So I recently challenged myself to begin meal prepping and planning. It made a HUGE difference. It drastically cut down my grocery bill as I was able to use the same ingredients for multiple recipes. I'm on a mission to change up my recipe routine to prevent getting stuck in a rut again. I'm trying to incorporate more vegetables and fresh ingredients because it's not only good for you, but also cheaper. And this recipe is so totally good for you! Of course it’s made with healthy, nourishing ingredients that will energise your day. This is also the perfect recipe for Fall. It's been awhile since I actually got excited about the Fall season but this year I'm a little excited. I don't know what it is, but I guess I'm anticipating change. 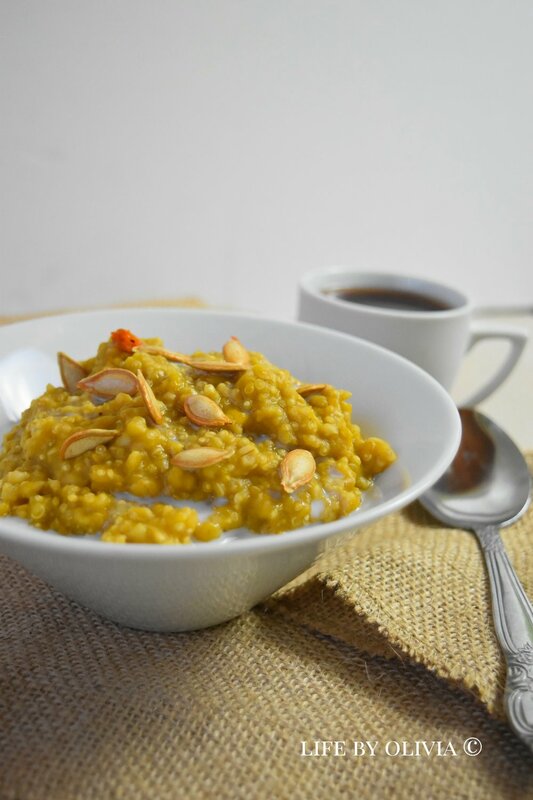 This Pumpkin Banana Oats breakfast is creamy, lightly sweet, and perfectly spiced for fall. You’re going to love it. Now you're probably saying Liv, I've never seen oats look so grainy and you're right. As I was cooking this, I realised I didn't have enough oats. I remembered reading somewhere that quinoa is like the new oats for breakfast so I added it. Newsflash: QUINOA IS NOT THE NEW OATS! It was so bad I couldn't even eat it. But I had already photographed this one. I had to make it over with just the oats a few days later and I felt redeemed. The banana sweetens this up nicely on its own, so you can totally make this without any added sugar. I think it tastes great with a little drizzle of pure maple on top, but that is optional. I also topped mine with extra milk and some pumpkin seeds, both of which make it even better. I think it’d be excellent with a few extra banana slices on top, as well. Go crazy! Mix all ingredients in a medium sauce pan and stir well. Bring to a boil, then reduce the heat, cover, and simmer for 12-15 minutes, stirring once or twice during the cooking time. The quinoa should be cooked and creamy. Top with optional toppings, if desired. If reheating the next day, you may need to add more milk. Enjoy!